Check out these four great bathroom remodeling design ideas to inspire you – and see what it takes to make them happen for your home. If you envision your bathroom as an escape into luxury relaxation, this is the design idea for you. A spa bathroom provides an at-home connection with pampering, comfort and true lavishness. This example of an open floor en-suite juxtaposes a dark wood bathroom design with a beautiful spa tub centerpiece. Spa bathrooms are for those of you out there who never want to leave the bathroom! Other features to consider include the following: heated floor tiles, a walk-in raindrop shower, distinct areas for relaxing in the tub or getting ready at the sink and a steam bath generator (to really accomplish the spa vision). Keep in mind that this renovation idea is a bit of a big one in terms of budget and scope. Go for big box store items over custom. You don’t have to have an all-custom job to get the bathroom of your dreams. Stores like Lowe’s and Home Depot have an solid selection of beautiful stuff for your bathroom. From tiles to tubs, sinks to showers, you can get it all at these stores and save a significant amount of cash. Allow some wiggle room on features. When you’re designing your bathroom, you need to stay flexible in some of the features. That way if you find less expensive options (like used tubs, tiles that are on sale, etc. ), you can add them in to stay within your tight budget. When looking for a better bathroom design, many people choose to go back to the room’s roots. It’s a bathroom after all, so maybe you should focus the room on the bath itself. Your new tub installation can become the showpiece of your entire bathroom with a little bit of work. As this example shows, the tub features a recessed step-over design with high tiles that surround the enclosure. Ceiling lighting over the bathroom can feature the tub as the attention-grabber in your bathroom, making it an attractive and desirable spot where you’ll always want to take a relaxing bath. This design can easily include other features such as an included shower or step-in tub. Many bathroom renovators can get carried away with an extravagant redesign. 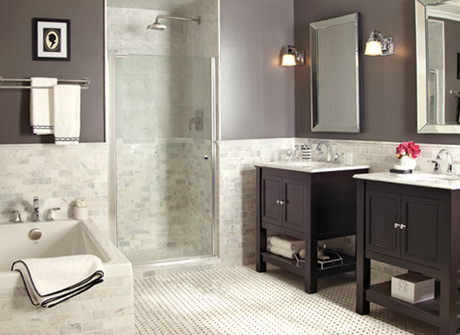 But when it comes to your bathroom remodel design, simple works too. The simple flat white provides a sheer luminosity and a clean, crisp, cohesive look. The center section of alternating black and white adds a dash of elegance to the idea, making it stand out even better. If you’re stalling on your design ideas, try scaling them back with simple, minimalistic styles. You may find a great bathroom with less instead of more.